Last updated by Shari Harley at November 25, 2018 . 1. 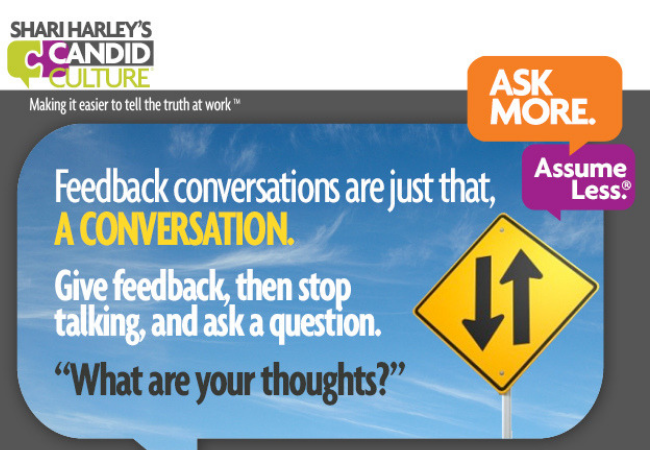 Introduce the conversation so feedback recipients know what to expect. 2. Share your motive for speaking so both the feedback provider and the recipient feel as comfortable as possible. 3. Describe the observed behavior so the recipient can picture a specific, recent example of what you’re referring to. The more specific you are, the less defensive he will be, and the more likely he’ll be to hear you and take corrective action. 4. Sharing the impact or result describes the consequences of the behavior. It’s what happened as a result of the person’s actions. 5. 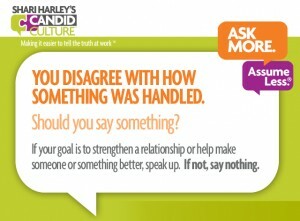 Having some dialogue gives both people a chance to speak and ensures that the conversation is not one-sided. Many feedback conversations are not conversations at all; they’re monologues. One person talks and the other person pretends to listen, while thinking what an idiot you are. Good feedback conversations are dialogues during which the recipient can ask questions, share his point of view, and explore next steps. 6. Make a suggestion or request so the recipient has another way to approach the situation or task in the future. Most feedback conversations tell the person what he did wrong and the impact of the behavior; only rarely do they offer an alternative. Give people the benefit of the doubt. If people knew a better way to do something, they would do it another way. 7. Building an agreement on next steps ensures there is a plan for what the person will do going forward. Too many feedback conversations do not result in behavior change. Agreeing on next steps creates accountability. 8. Say “Thank you” to create closure and to express appreciation for the recipient’s willingness to have a difficult conversation. If you’re giving more than one piece of feedback during a conversation, address each issue individually. For example, if you need to tell someone that she needs to arrive on time and also check her work for errors, first go through the eight steps in the formula to address lateness. When you’ve discussed an agreement of next steps about being on time, go back to step one and address the errors. But talk about one issue at a time so the person clearly understands what she’s supposed to do. Step One: Introduce the conversation. Step Two: Share your motive for speaking. Just because you’re direct doesn’t mean you’re not empathetic. But remember, these are my words. You’ll need to find your own words that you feel comfortable using to deliver such a difficult message. Step Three: Describe the observed behavior. Step Four: Share the impact or result of the behavior. Step Five: Have some dialogue. Ask the recipient for his perception of the situation. Give John time to say whatever he wishes to say. Step Six: Make a suggestion or request for what to do next time. Because of the awkwardness of this subject, skip step seven, and go to step eight. You might be gasping, thinking there is no way you could ever tell someone he smells. It’s definitely an awkward conversation, one I hope you never have to have. I used one of the most difficult things you will ever have to say to demonstrate that even the most awkward feedback can be delivered empathetically and quickly. The short and concise body-odor conversation is a lot less uncomfortable for the recipient than the drawn-out, evasive first version. Just think, would you rather listen to someone tell you that you smell for two minutes or for twenty? You may also think, “I shouldn’t have to tell someone to take a shower and wash their clothes.” That’s true, you shouldn’t. But if you’re working with someone who doesn’t do these things, clearly someone needs to tell him. Remember, other people are not you and don’t do things the way you do, even when those things appear to be no-brainer basics. Lastly, you may think that telling someone to shower and wash his clothes is insulting and demeaning. It’s true: No matter how you spin it, there’s nothing nice about this message. But which is worse, having your coworkers ask for different desks and be unwilling to work with you, or having someone who has your best interests at heart tell you privately to clean it up—quite literally? When you tell people the truth, you do them a favor. Embarrassing as it sounds, this went on for more than a year. I wanted to be seen as accessible and open, yet this “lingering” method of interrupting was driving me crazy. And it was a waste of both of our time. After many months of frustration, I decided to use the eight-step Formula. Steps Four and Six: Share the impact or result of the behavior and make a suggestion or request for what to do next time. “Because I’m in the middle of something completely different, it takes me a few seconds to catch up. By the time I have, I’ve missed key points about your question and I have to ask you to start over. This isn’t a good use of either of our time. Step Five: Have some dialogue. Allow the recipient to say whatever she needs to say. Step Seven: Agree on next steps. We have just managed “the lingerer”—a challenge you probably have, unless you work from home or in a closet. You may have noticed that I changed the order of the Feedback Formula during this conversation. It’s not the order of the conversation that’s important. It’s that you provide specific feedback, offer alternative actions, and have some dialogue before the conversation ends. Summary: Good Feedback Is Specific, Succinct, and Direct. Provided you have a trusting relationship with someone and have secured permission to give feedback, there is very little you can’t say in two minutes or less. The shorter and more direct the message, the easier it is to hear and act upon. Follow the eight-step Feedback Formula. Be empathetic and direct. Cite specific examples. Give the other person a chance to talk. Come to agreement about next steps. Remember, you do people a favor by being honest with them. People may not like what you have to say, but they will invariably thank you for being candid. This week’s blog is an excerpt from my book How to Say Anything to Anyone: A Guide for Building Business Relationships That Really Work. I hope it helps you have the conversations you need to have! Be candid. You can do it! Give Feedback or Say Nothing? Most of us grapple with whether or not we should give feedback when someone else does or says something frustrating. Do you have a relationship with the person? Do you know each other well enough to share your opinion? Aka, have you earned the right? Has the other person requested your opinion? Unsolicited feedback often goes on deaf ears. If the other person has not requested your opinion, does he appear open to hearing feedback? Are you trying to make a difference for the other person or just make him look or feel badly? Do you want to strengthen the relationship? Before you give feedback, do something I call, ‘check your motives at the door.’ If your motives are pure – you want to strengthen the person or the relationship, and you have a good enough relationship that you’ve earned the right to speak up — then do it. People are more open to feedback when they trust our motives. 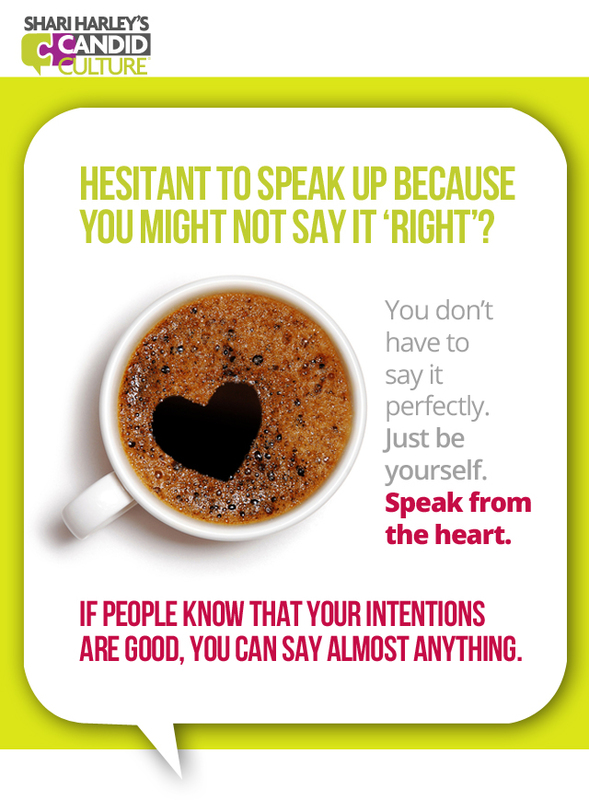 If we have a good relationship with the person and he knows we’re speaking up to make a difference for him or for the relationship, you’ll be able to say way more than if your motives are questionable – aka you want to be right. How to Give Feedback – Worried You Might Not Say It Right? Many people worry about giving feedback because they fear they don’t have the ‘right’ words. They’re concerned they’ll say ‘it’ wrong and damage their relationships. Feedback is hard enough to give without worrying about saying everything perfectly. Worry less about having all the right words and more about whether or not people trust your motives. When people trust your motives – why you’re giving feedback – you can say almost anything. When they don’t trust your motives you can say almost nothing. Getting negative feedback is hard. It’s easier to listen to feedback when we trust the person who’s giving us the feedback – we know their intentions are to help versus to judge or hurt us. Speak from the heart, be authentic, and worry less. Be yourself. If you’re nervous to say what you want to say, tell the other person you’re nervous. If you’re struggling to find the right words, say so. If you’re worried you’ll damage the relationship or that it isn’t your role to give the feedback, say that. Authenticity goes a long way. Other people aren’t expecting you to be perfect. But they do want to know they’re working with a human being. And human beings are fallible. We have fears. We make mistakes. And sometimes we don’t say things perfectly. You don’t have to be perfect, you just have to be real. One of the hardest things I’ve ever done is hire someone to care for my almost two year old son. “Here is the person most important to me in the world. Keep him alive.” I had no idea how difficult it would be to trust a relative stranger so implicitly. And as a result, let’s just say I’ve not been the easiest for a nanny to work with. I’m embarrassed to admit that I wrote sixteen-pages of instructions of how to take care of my kid. And I gave that ‘booklet’ to a nanny with much more childcare experience than I have. When I work from home and hear my son crying, I tell myself not to walk into the room and check on him, knowing it undermines the nanny, but I do it anyway. When the nanny sends me an update of when my son last ate, I reply telling her when he should eat again, even though I know she knows. Yes, I’ve really been doing these things. Each time I over instruct, monitor, and advise, I regret it. I know micromanaging the nanny makes me difficult to work with, which is not how I want to be. It reminds me of a comment an old boss said to me after we interviewed a candidate for a job together. He said, “Shari, your job as the interviewer is to make the candidate feel comfortable and ensure she leaves feeling good, regardless of how well or poorly she interviewed.” My face must have said anything but, “I want you to feel comfortable and you’re doing a great job.” His words stuck with me and I’m reminded of them each time I over manage our nanny. Many people attend training on how to manage others; I’d suggest we also look at how we manage ourselves. How does working with you make people feel? 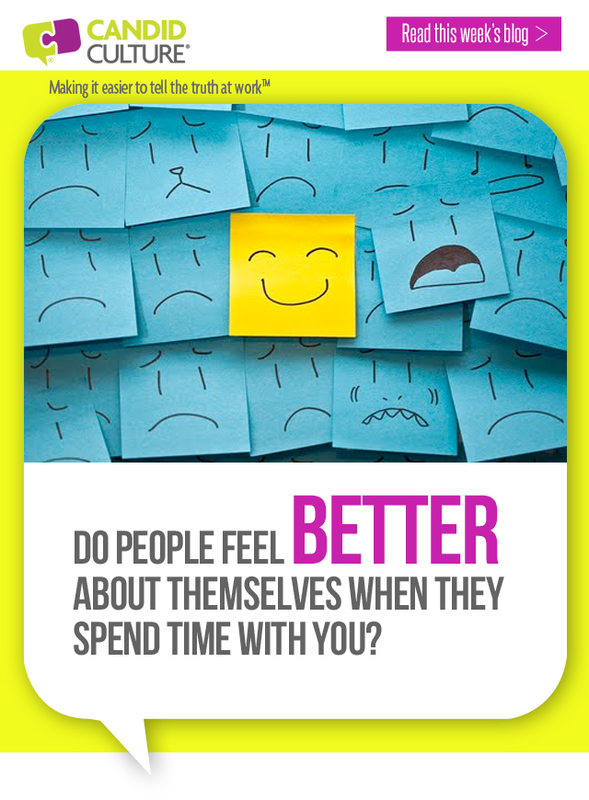 Do your questions, requests, and interactions make people feel more self-confident and valued or do people feel questioned and undermined? Do you pick your battles? Do you give just enough direction but not so much as to squelch the other person’s ideas, initiative and spirit, especially when the stakes are high? As you know, I’m evaluating how I do these things too. We are always a work in progress. Build Confidence 1: Ask people for their ideas and implement those ideas whenever possible. And if you aren’t open to others’ ideas, don’t ask for them. It’s better not to ask for ideas than to ask when you’re really not interested. Build Confidence 2: Ask for and be open to others’ feedback. People will be more receptive to your feedback when you’re receptive to theirs. Build Confidence 3: Say “thank you” regularly and mean it. Give specific examples about what you’re thankful for. Build Confidence 4: Admit when you’re wrong. Strong people admit mistakes, weak people don’t. People can work with you, around you, and against you. Earn loyalty and respect by respecting others’ talents and knowing when to take a step back. It’s not easy to admit when we’re overwhelmed and need help. In fact, it’s such a hard thing to say that instead of asking for help, most of us either work harder or longer or job hunt. Admitting work overload isn’t a weakness and it isn’t bad. It’s all in how you handle it. If you find yourself with work overload and you aren’t sure what to do, consider taking these four steps. Eliminate work overload step one: Every time you find yourself doing something that someone else could and should do, write it down, including how much time the task took. Doing this will create awareness of how much time you spend doing things that may not be the best use of your skills and experience. Then work with whomever you need to in your organization to align that work where it belongs. This practice isn’t to make you sound like an entitled prima donna. It’s an entrepreneurial way to approach your work. The business owner’s mantra is, “If I can pay someone less than I get paid to do something, I should do that.” Consider how you can apply that practice to your workplace, without appearing to be someone who won’t ‘wash windows.’ Meaning, you don’t want to be or appear to be someone who isn’t willing to do grunt work. Every job has it. But those tasks shouldn’t be where you spend most of your time, unless your job description and annual goals say so. Lots of people are at work longer than they need to be because of time spent talking with coworkers they don’t know how to ask to go away. You’re doing everyone a favor when you end conversations that are distracting. If you really want to talk about what’s happening with your coworkers’ kids, mother-in-law, and home renovation, go to lunch or happy hour. Eliminate work overload step three: Sometimes doing 110% percent isn’t important. Notice when you’re doing more than you need to and when that additional work doesn’t add significant value. I.e., you put together an elaborate PowerPoint presentation and then spent five more hours printing and stuffing folders to put the presentation in. Next time, focus on the content and worry less about the aesthetics. 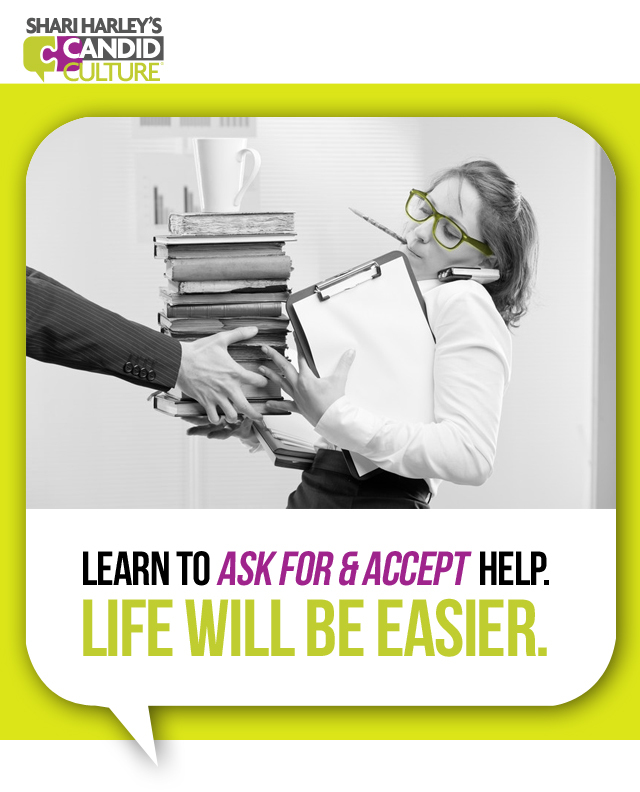 Eliminate work overload step four: Lastly, know when and how to ask for help. The last organization where I worked, before starting Candid Culture, was very fast paced and lean. I worked all the time and consistently felt overwhelmed. I eventually went to my boss to ask for help. I made a list of everything I was working on and asked him to rate each item based on how important he saw the project/task. He put an “A” next to the things that needed to get done first, a “B” next to the things that came next, and a “C” next to the things that were the least important. He told me to do the A’s first, then the B’s, and if I got to the C’s, great, if not, no problem. The meeting was eye opening for me. I assumed he thought everything on my list was an “A” and that left me stressed with an inability to prioritize. Hearing how he perceived my workload reduced my anxiety and gave me permission to ease up on projects I’d previously considered timely. Don’t suffer in silence. But do approach reducing work overload in a positive way. Rather than whining to your boss and coworkers, end conversations that you know are a time drain, limit work that doesn’t add significant value, and ask for help prioritizing when you can’t do it for yourself. One of the hardest things I’ve ever done is hire someone to care for my infant son. “Here is the person most important to me in the world. Keep him alive.” I had no idea how difficult it would be to trust a relative stranger so implicitly. And as a result, let’s just say I’ve not been the easiest for a nanny to work with. I’m embarrassed to admit that I wrote sixteen-pages of instructions of how to take care of my infant son. And I gave that ‘booklet’ to a nanny with much more childcare experience than I have. When I work from home and hear my son crying, I tell myself not to walk into the room and check on him, knowing it undermines the nanny, but I do it anyway. When the nanny sends me an update of when my son last ate, I reply telling her when he should eat again, even though I know she knows. Yes, I’ve really been doing these things. P.S. Congratulations to our Denver Broncos! The highest and best use of my time at Candid Culture is talking to current or future clients, writing new material, and delivering keynote presentations or training programs. I really shouldn’t do anything else. I can do a lot of things – like talk to vendors, count inventory, order supplies, and pack product orders – but none of those things add value to the business the way speaking, training, writing and spending time with clients does. The business owner’s mantra is, “If I can pay someone less than I get paid to do something, I should do that.” Consider how you can apply that practice to your workplace, without appearing to be someone who won’t ‘wash windows.’ Meaning, you don’t want to be or appear to be someone who isn’t willing to do grunt work. Every job has it. But those lower level tasks shouldn’t be where you spend most of your time, unless your job description and annual goals say so. Eliminate work overload step three: Sometimes doing 110% percent isn’t important. Notice when you’re doing more than you need to and when that additional work doesn’t add significant value. I.e., you put together a PowerPoint presentation and then spent five more hours printing and stuffing folders to put the presentation in. Next time, focus on the content and worry less about the aesthetics.